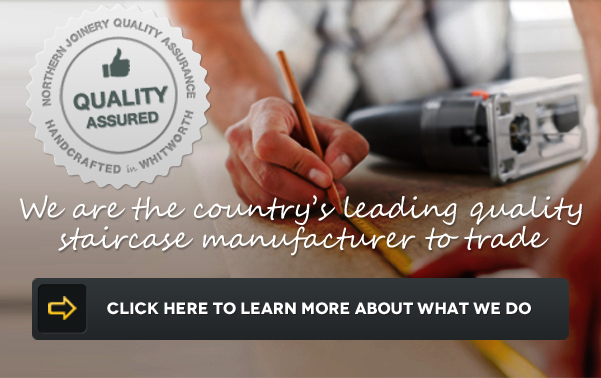 All staircase designs are checked, prior to manufacture, for compliance with British Standard 585 Parts 1 and 2, the Building Regulations, the Building Standards (Scotland) Regulations and the NHBC Standards. Any anomalies are resolved with the customer prior to manufacture. Winder staircases are all designed and manufactured on our bespoke CAD CAM machinery to finite accuracy and tolerances. 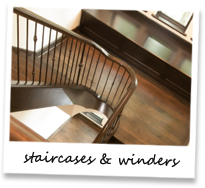 Winders can either be factory erected or factory pre-fitted. All loose components are identified for ease of re-assembly with all wedges, screws and glue blocks supplied. 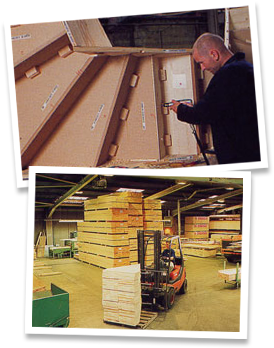 The use of 22mm MDF for winder treads gives greater stability and reduced maintenance costs. Factory erected winders ensure speed of site fixing with minimum reliance on site skills. Winders can be supplied in a variety of different styles and designs: 3 tread, 4 tread, 6 tread, 8 tread. All winders can be designed with or without newels and can be supplied to site in different ways. Factory fitted - winders are fully assembled in the factory. We even screw the risers to the back of the treads! All components are fully identified before parts of the winder are dismantled for ease of handling and off loading into the property on site with the utmost ease. Dry fit - staircases have the winder treads tried in the ramp string trenchings, and in the newel, all components are fully identified, dimensions are checked ensuring the staircase will go together easily on site. All wedges, glue blocks and screws are supplied bagged and stapled to the underside of the staircase.